Mozilla released the beta version of Firefox 4, the upcoming build of the popular web browser for Windows, Mac OS and Linux. The Mozilla Firefox 4 has a redesigned user interface that replaces the position of tabs to the top of the browser. There is a new Firefox button with all the options of the browser arranged together for easy access. Firefox 4 loads quick and open web pages fast. Other features of Mozilla Firefox 4 includes “switch to tab”, “App tab, WebM HD video support and fix for common security vulnerabilities. A brand new design: The design of the Firefox 4 is minimal and visually pleasing. 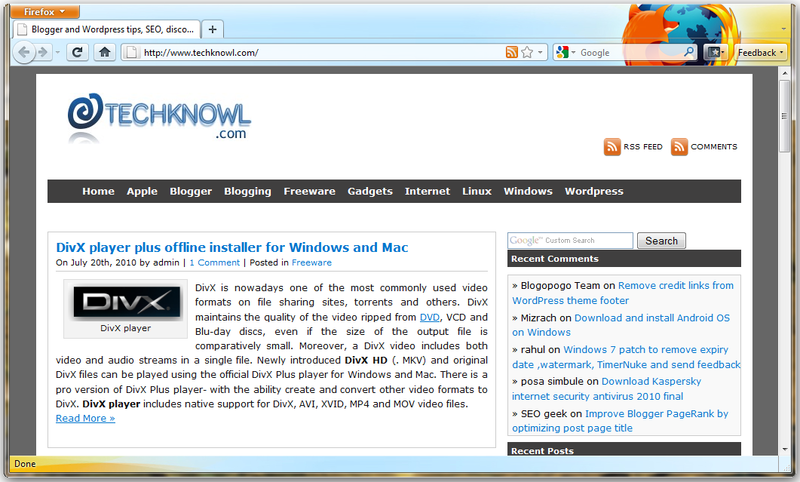 It is somewhat similar to Google Chrome and Safari web browsers. Option to send feedback to Firefox developers. Switch to Tab: Enable users to move quickly to a new tab while entering URL on the browser bar. Addon tab: Option to add favorite applications to the browser tab. Initiatives to prevent the security holes that would lead to CSS sniffing history attack, XSS exploits and others. Support for WebM, the Google supported open video format that enables HD content on web pages. Last month we shared download link for the USB installer of Safari 5. Portable installers are made from the official installer of applications, and can be used on computers where the administrator blocks user installation. Moreover, it is possible to install and carry them on USB disk. Here we have the portable installer of the Firefox 4 web browser. Download Firefox 4 portable here. Please note that Firefox 4 is still under testing. We will add the portable installer of the final version when it comes out of the test period.